Finderpalooza part 3...8x50 Finder with Bracket Sold! While we were cleaning out our warehouse we stumbled across some great items that we just want to move. 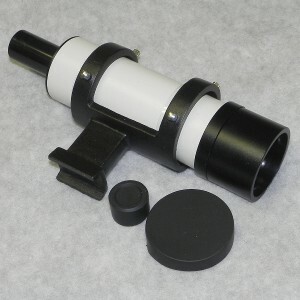 AT850M 8 x 50mm straight-through dark crosshair finder and mounting bracket from AT6M Maksutovs, no A-T label, has foot that fits mounting shoe on Orion, Celestron , Sky-Watcher, and GSO refractors and Newtonians, $49.95 with free shipping. Only 0 Left. Not really sure why we have them, but our discovery is your gain. You can call us at the store to buy, or contact us via Cloudy Nights. All major credit card are welcome as well as Paypal.